The Formatt 105mm Skin Tone 3 Enhancing Water White Glass Filter is designed to improve skin tones on portrait subjects. It's also perfect for shooting outdoors when sunlight is clouded over and gray. This enhancer is especially useful for the digital and video market where subject appearance is critical. By using this filter, if your subject feels that he/she is looking their best, your interview or presentation will come off at its best. The Skin Tone Enhancer is available is different grades which allow you to select the most flattering 'shade' for your subject. 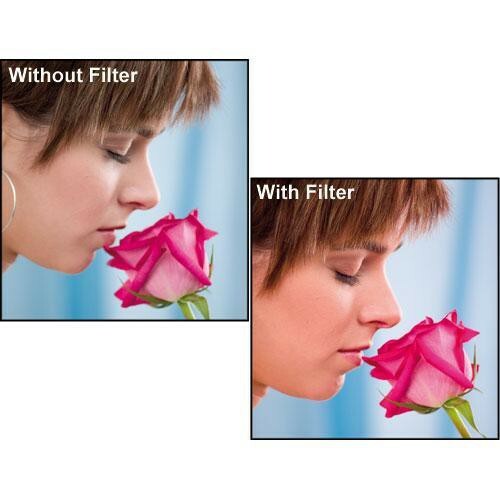 Additionally, this filter is very effective for foliage, earth tones, or anything that seems 'too blue' in open shade. Portraits done outside on gray days take on a 'pasty' nature which do not necessarily compliment subjects. Adding a degree of warmth brings skin and other tones back to a normal look. Formatt, a company with three generations of professional filter-making experience produces every filter to the highest technical standards. The finest materials, together with state of-the-art production technology, have resulted in a standard of optical excellence unmatched anywhere else.